After farmers harvest agricultural products, what do they need to do? To whom do they sell their products? When they sell agricultural products, what factors do they need to pay attention to? You may say that vegetables and fruit have to be fresh, and that the products should be of good quality. But what does “good quality” mean? How can you judge whether the products are good or not? Who decides whether the products are good enough or not? 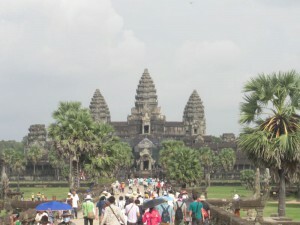 Siem Reap in Cambodia is a town known for Angkor Wat, which is designated as a World Heritage Site. A lot of foreign tourists visit the site throughout the year. According to the Ministry of Tourism in Cambodia, the number of tourists who visited Angkor Wat in 2012 exceeded 2 million. In downtown of Siem Reap, tourism-related infrastructure has been developed, and also more and more sophisticated cafes and restaurants have been opening. 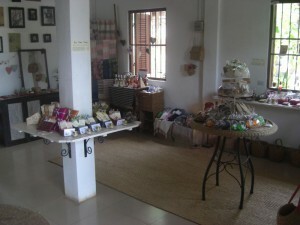 Along with the increase in the number of foreign tourists, not only refined cafes and posh restaurants but also shops dealing with relaxation goods have drastically increased in downtown Siem Reap. The photo below (upper left) shows a shop specializing in products, such as herbal tea, soap, massage oil, and various kinds of cosmetics. 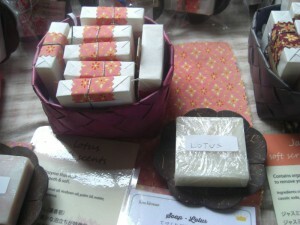 All the products in the shop are made from organic substances. 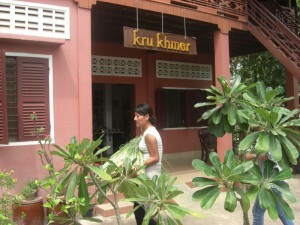 The name of the shop is Kru Khmer, which means “traditional healer” in Khmer. In the establishment, there is also a workshop. 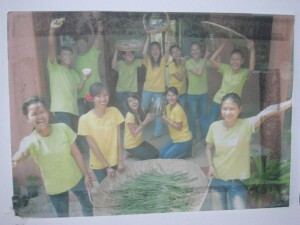 Young Cambodians work there and help in the process of turning organic plants into relaxation goods. 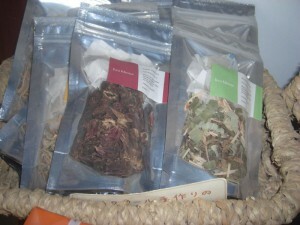 The relaxation goods are also sold in the shop. Since 2007 the Japan International Volunteer Center (JVC) has instituted a project on community livelihood improvement through ecological agriculture in rural areas in Cambodia. The project site is a couple of hours drive from downtown Siem Reap. 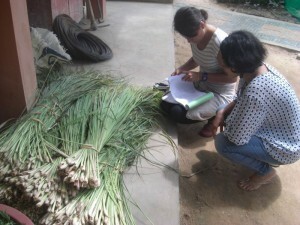 In the project, villagers learn how to practice organic agriculture (http://www.ngo-jvc.net/en/cambodia.html). They produce vegetables and fruit without using any chemical fertilizers, herbicides, or pesticides. When one member of the JVC staff was looking for a buyer for the agricultural products cultivated in the project, she met the owner of Kru Khmer. The owner told the JVC staff member that she was willing to buy organic agricultural products and told the staff member that the price for each agricultural product was based on weight. 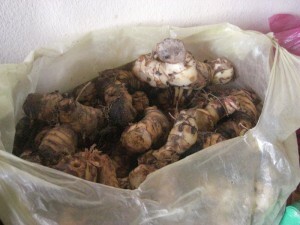 Several weeks later, the JVC staff member brought some agricultural produce, such as lemon grass, ginger, turmeric, and lotus flowers to Kru Khmer. 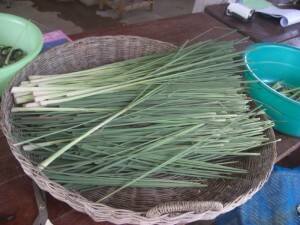 However, when the lemon grass was shown to the owner of Kru Khmer, the owner was a little upset. Why? The JVC staff member brought lemon grass to the shop without cutting the edges (photo above left). 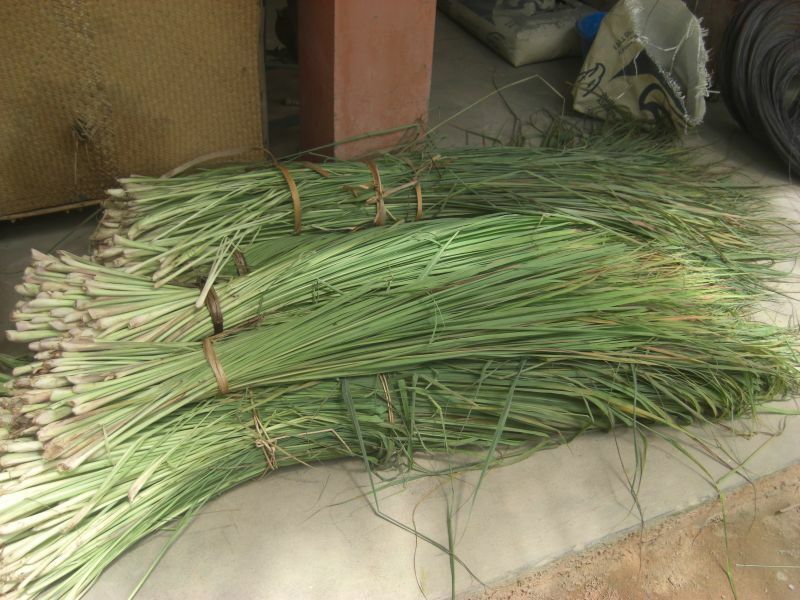 The shop owner looked a little disappointed to see that, and said that she had expected lemon grass with both edges neatly cut (photo above right). 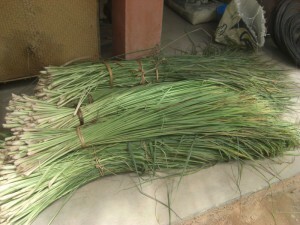 The shop owner only buys lemon grass from producers with the edges cut down. She had told the JVC staff member at what price she would pay per kilo. It was obvious that the price would differ depending on whether it was “with” the edges or “without” the edges. It was hard for the JVC staff member to accept the “price policy” of Kru Khmer because she had already told the producers how much they would be paid per kilo. A similar problem happened with ginger. What is the difference between the two photos below? Before the JVC staff member brought in ginger, the owner had only informed her that the price was based on weight. She did not tell her that the ginger should be dried in the sun for a week or so, let alone the moisture content. 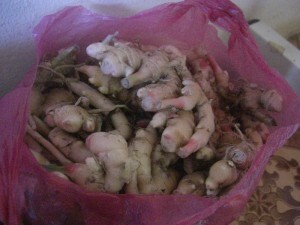 For the owner, it was taken for granted that after the ginger is dried in the sun for 5-6 days, it is brought to Kru Khmer. However, for the JVC staff member, who would be bringing in ginger for the first time, it was quite natural that she wouldn’t think about moisture content. It is obvious that dried ginger weighs less than when wet. Since the JVC staff member weighed the ginger with the producers when it was wet, they expected that the income would correspond to the weight of the wet ginger. 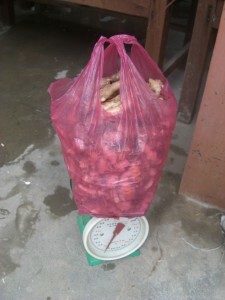 When the ginger is dried at Kru Khmer, the producers will end up being paid less than they had expected. As this was the first time doing business, there were discrepancies in understanding the product requirements between the seller (JVC) and the buyer (Kru Khmer). Through this experience, the buyer learned that she needs to inform the seller of all the specific requirements in advance, such as size, shape, and moisture content; the sellers learned that they need to know from the buyer specific requirements, such as size, shape, and moisture content. Such confirmation in advance is a must in order to avoid misunderstandings. With regard to moisture content, a moisture scale will help avoid miscommunication. In the case that neither the buyer nor the producer has a moisture scale, it would be better to be agreed on how many days the products should be dried in the sun. The more specific the requirements are known, the better marketing is possible. In other words, proper post-harvest treatment can be one form of value-addition. As for the lotus flowers that the JVC staff member brought to the shop, the number of lotus flowers were simply counted by the owner, and all of them were purchased without any problems. 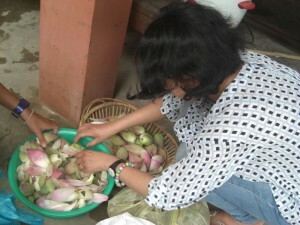 The lotus flowers will be used as ingredients for soap in Kru Khmer. Having learned from this experience with Kru Khmer, the staff member asked the manager of Kru Khmer to make a manual explaining the specific requirements for each product (e.g., size, shape, moisture content, etc.). After the manual was produced, it has helped the JVC staff with quality control of the agricultural products in the project.